To date, 181 countries have signed and ratified the World Health Organization (WHO) Framework Convention on Tobacco Control. With the aim of limiting the consumption of tobacco and its life-threatening consequences and reducing the number of smokers. The agreement is considered a success because in many countries, at least the countries of the Global North, smoking rates have significantly reduced. The consumption of tobacco products is widely known to be a health risk. Every year, WHO estimates that more than 7 million people die as a result of tobacco use. But the tobacco industry does not only pose a serious health risk, it also has negative environmental and human rights impacts. The clearing of forests and the use of child labour play a part in the cultivation, harvesting and processing of tobacco. In Germany alone, the resulting costs of tobacco consumption amount to several billion euros per year. However, particularly in the countries of the Global South, the problems related to tobacco cultivation and consumption of tobacco products have a particularly negative impact and pose a serious threat to the implementation of international development goals. The billion-dollar tobacco industry, with its purely growth oriented business model, also flouts internationally recognized social and environmental norms and shares in the responsibility for human rights violations and environmental pollution. It also plays a dishonourable role in the implementation of the WHO Agreement: It attempts, with some success, to prevent its implementation of the Agreement through massive lobbying. Tobacco producers are, by all appearances, still more interested in their product sales than the consequences of their consumption. Unfortunately, the tobacco business is still highly profitable, while the costs related to the negative impacts of consumption and cultivation are externalized and borne by society. 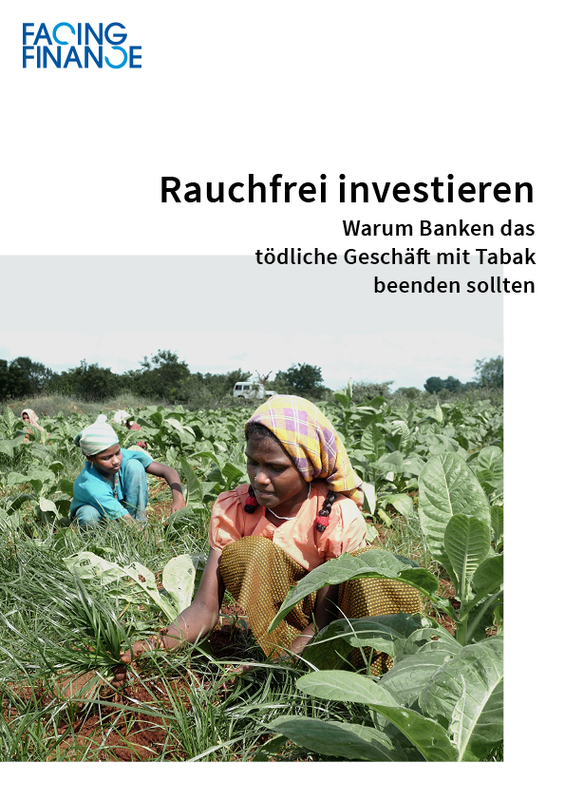 High returns from the tobacco industry have always attracted financial institutions, including banks, insurance companies, pension funds, and asset managers, who invest and / or finance large amounts of tobacco. In this way benefiting from the harmful business model of the tobacco industries. In this report, European financial institutions and their financial relations with the five largest publicly traded tobacco companies have been analysed. The results show a total of 24 European financial institutions since 2013 have lent around € 50 billion to the tobacco companies Philip Morris International, British American Tobacco, Altria, Japan Tobacco and Imperial Brands. Equities and bonds totalling approx. € 45 billion and equity holdings of approximately € 14 billion. The supply of capital (loans, issuance of shares and bonds) thus accounts for over 86% of the financial relationships with tobacco companies. A value that clearly demonstrates the enormous supportive power as well as the responsibility of the financial service providers with regard to the damaging business models of the tobacco industry. The six German financial institutions examined in this report alone have granted loans to these five companies amounting to around € 8 billion, issued bonds and shares worth around € 7 billion, and hold shares of € 6 Billion.